Doug Ford thwarted his attempt to be elected Peel Region chair. 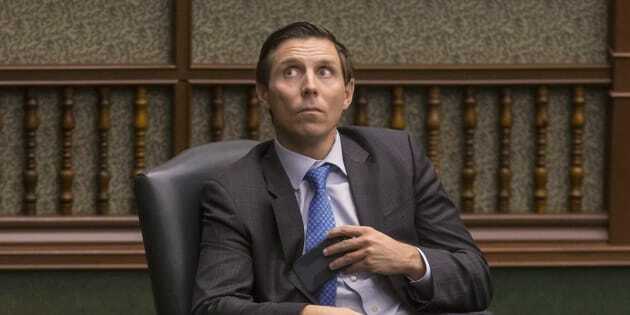 Former Ontario PC leader Patrick Brown in the Ontario legislature in Toronto on March 28, 2018. Patrick Brown is back at it again. The former Ontario Progressive Conservative leader registered Friday to run for mayor of Brampton, mere hours after his bid for chair of Peel Region was thwarted by the very man who replaced him. Earlier in the day, Ontario Premier Doug Ford revealed plans to cancel elections for the influential chair position in Peel Region, which includes Brampton, Caledon, and Mississauga. Ford is also scrapping votes for chair seats in York and Niagara Regions and moving to slash the size of Toronto's city council by almost half. Brown told CP24 that while he disagrees with the premier's decision, he still wants to serve the people of Brampton, a growing suburban city northwest of Toronto. "I still want to contribute and frankly is at the heart of Peel Region. Where better to contribute to public service? Where better to help families," he said. Ford told reporters Friday that his decision to upend municipal elections set for October was not about retribution with old rivals on Toronto city council or with Brown, who launched his comeback attempt earlier this month. When asked if he felt Ford was trying to cut him out of public life, Brown said he was focused only on the future. Brown stepped down as Ontario PC leader in January after two women accused him of sexual misconduct while he was a federal Conservative MP. Brown denied the allegations as fabrications and has filed a $8-million defamation suit against CTV News. He's also releasing a tell-all book about what he has characterized as a political "assassination." In a stunning twist, Brown joined the Ontario PC leadership race in February — a contest triggered because of his resignation — but quit less than two weeks later. Ford won the contest in March and later blasted Brown on the campaign trail for, in his words, leaving him a mess. Brown's breakup with Ontario Tories got uglier when the party brass made it clear he would not be welcome in the caucus or to run under the party banner. In April, Ontario's ethics commissioner ruled breached integrity rules related to his personal finances. Though he represented Barrie in the House of Commons from 2006 to 2015, and the riding of Simcoe North in the Ontario legislature, The Globe and Mail reported in June that Brown moved to Mississauga in the spring to live with his fiancée, Genevieve Gualtieri. His social media accounts have shown him campaigning hard in the Peel Region and attending numerous events in Brampton in recent weeks. When a reporter noted Brown had been recently living in Mississauga, he responded that he had "deep roots" all over the Peel Region and briefly practiced law in Brampton. Brown is up against incumbent mayor Linda Jeffrey, who was a Liberal MPP from 2003 to 2014 and served in cabinet, as well as handful of other candidates. Jeffrey took Twitter to point out that Brown is not from Brampton. While I welcome Mr. Brown's entry into the race I would like to bring to the attention of Brampton voters that the ink barely dried on his lease before he decided to seek our city's highest office. Brown called Jeffrey's tweet a U.S.-style approach to politics. "It's an example of not being proud of your own record," he said. "If the mayor was proud of her record on public safety in Brampton, on jobs in Brampton, on gridlock in Brampton, she'd be talking about that."